Sooo I know Hot Topic came out and said they would not be carrying her, but there were glam photos and whatnot so I have a feeling this Dorbz might have been produced in some capacity? Last edited by CaseyJones14 on Thu Nov 01, 2018 12:22 pm, edited 1 time in total. They were made, but the entire run was defective. Gothamite wrote: They were made, but the entire run was defective. Well boo! I wonder what the damages actually were? Thanks for the link and picture! 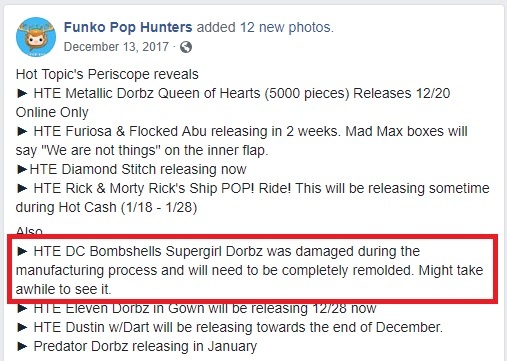 I really hope this does get re-done (I doubt it, personally), it was my most-wanted Bombshells Dorbz! Even re-molded, I'm surprised there hasn't been a new update or glam shot. I wonder if it's still happening.